Although rambling is basically walking in the countryside you do need to have some additional basic knowledge and skills before you set off. If you’re going rambling, it’s fair to say that you won’t get very far without being able to read a map. It’s vital to know exactly where you are at all times, especially if you’re not an experienced rambler. An Ordnance Survey map is usually the best bet, particularly if you’re planning to go hill walking. Being able to use a compass properly goes hand in hand with map reading, especially if you’re hill walking. Having both skills isn’t a requirement if you’re new to rambling, but it’s useful if you can gain them in your first year. It’s always helpful to know a bit of basic first aid before you start rambling. After all, you never know when you’re going to need it!The basic items needed for a first aid kit are plasters, foot pressure pads, support bandages, insect repellent and antiseptic. The golden rule of basic first aid is ABC - airways, breathing and circulation. If someone loses consciousness, they may be unable to keep their airways open, which will obviously have a big effect on breathing and circulation. If he or she is on their back, you may need to tip their head backwards to make sure that their tongue doesn’t obstruct their airways. If it is safe to do so, you should put the injured person into the recovery position (and move him or her onto their side to stop their tongue blocking their airways) until medical assistance arrives. You can learn basic first aid through training courses run by the St John Ambulance or the British Red Cross. A spare rucksack full of basic supplies like food, water and spare clothing is a good idea. Chocolate, glucose tablets and energy drinks are particularly important in case you are stranded for some time. Pack some sun cream and sunglasses for warmer weather. 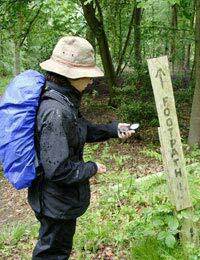 Have a look at our other articles on rambling for more advice on the equipment needed. It’s important to know how fit your group is a whole - it’s no good planning a ten mile hike if one of you is unlikely to get that far. Appoint at least one member of your group as a leader, and have them call the shots. A designated leader needs to be able to use their own judgement effectively, especially if an emergency occurs or you find yourselves going half a mile in the wrong direction. Leaders should have basic first aid skills and be good navigators. This is even more important if the weather takes a sudden turn for the worse. Most of these skills aren’t too challenging, and can be easily picked up if you’re planning to go rambling on a regular basis. You can get away with having just one person in your group with the necessary skills and knowledge, but it’s much better if each of you learns the skills individually. If you have one person with the right skills, and he or she gets injures, you’re going to be in big trouble!